Last week John spoke at Google about exercise and stress. You can watch the talk on YouTube or below. John wrote a short essay for the Freakonomics Blog on the New York Times Web site. He addressed the question: How Much Progress Have Psychology and Psychiatry Really Made? - Seattle Times feature article - "12 rules to boost your brain power"
- Web tutorials for all 12 brain rules. 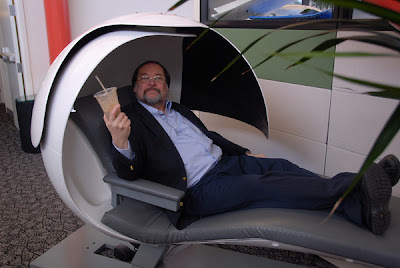 John Medina testing the Sleep Pod at the Googleplex. I summoned my presence to this blog because I have an interesting suggestion for the Brain Rules website. It would be cool if there was a quiz for each of the chapters testing the readers comprehension. Then it would be even more of a learning experience. But I must say, participating in the "Brain Rules Phenomenon"-reading the book, watching the DVD, browsing Brain Rules YouTube videos, exploring the Brain Rules website... is already an unparalleled learning experience about the brain. Thank you so much creators. I just finished the Wiring chapter-how fascinating. I was really enthused at the end of the chapter when Medina wrote: "I have come to believe that people with advanced Theory of Mind skills-"the ability to understand the interior motivations of someone else and the ability to construct a predictable 'theory of how their mind works' based on that knowledge" (pg. 67)- possess the single most important ingredient for becoming effective communicators of information" ( pg. 67). The reason I got excited is because developing "Theory of Mind" skills has been my latest passion. According to Myers-Briggs and Keirsey Theories, I am an Idealist, one of the 4 types of people that from an early age has a natural tendency to empathize with other people, to put themselves in other people's shoes. My yearning to empathize maybe why I am so interested in "Theory of Mind" skills and why I plan on getting certified in "Keirsey Temperament Theory."